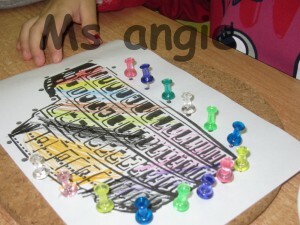 This is an activity from Montessori Practical Life area and it is very easy to prepare. The activity mainly help to refine the children fine motor skill and eye-hand co-ordination, it also helps the children to extend their attention span indirectly. How to work with the child? It is very important to remind the children that the needle of the pin is very sharp so we have to be very careful when we work with it because we don’t want to hurt ourself or friends. Have the child to use his first three fingers to hold the pin then put into the dot perpendicularly one by one. When he finished have the child to put the pin out. It is better to wait until your child reach 3 years old or above and it is amazing to see the child can concentrate on his work over 20 minutes. Remark: adult supervision is highly recommended for children!